The serve is the most complicated stroke in tennis. It’s also one of the most difficult to teach. Until now. If you’re not familiar with the ServeMaster by Total Serve, this article could potentially be your gateway to the serve you’ve always wanted. 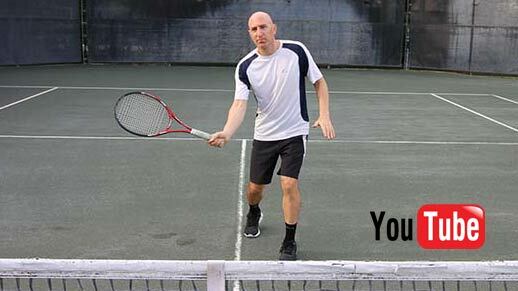 Whether you are a beginner learning how to serve in tennis, or if you have been playing for years but never properly learning the effective serve mechanics, this post is for you. This post could even save years of time and a lot of cash on expensive lessons. 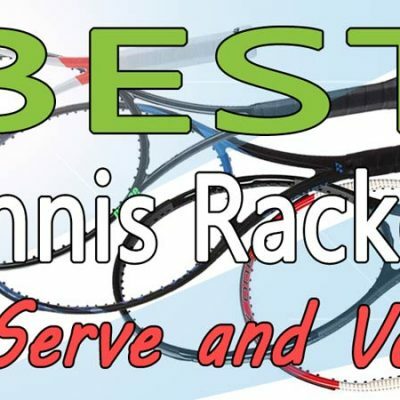 Keep reading if you want to learn how to serve or how to improve your serve in just 10 minutes! The results I’ve seen with the Total Serve never cease to impress me. 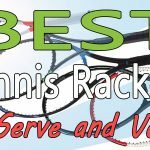 In this article, I’m going to show you how to use it and a few great drills you can use it for on improving your serves and even your overheads. In my years of coaching and playing, I’ve seen many kids and club players struggle with their serve for all kinds of reasons. Often, the problem is a bad toss coupled with poor serve mechanics. I can often narrow it down to a much more specific hitch like not hitting up on the ball or a lack of knee bend. There are so many things that could go wrong with a serve and they are typically difficult pinpoint and then to correct. If you address one issue, it creates another one. I honestly don’t even know how players learned to serve quickly before the ServeMaster was invented. It’s such a useful tool for both adults and kids. Anyone, no matter what their level, can use it. 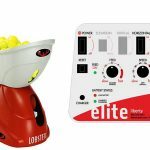 The ServeMaster is a teaching tool for the serve and overhead strokes in tennis. It was created by a former professional tennis player named Lisa Dodson. It’s made entirely of rubber. 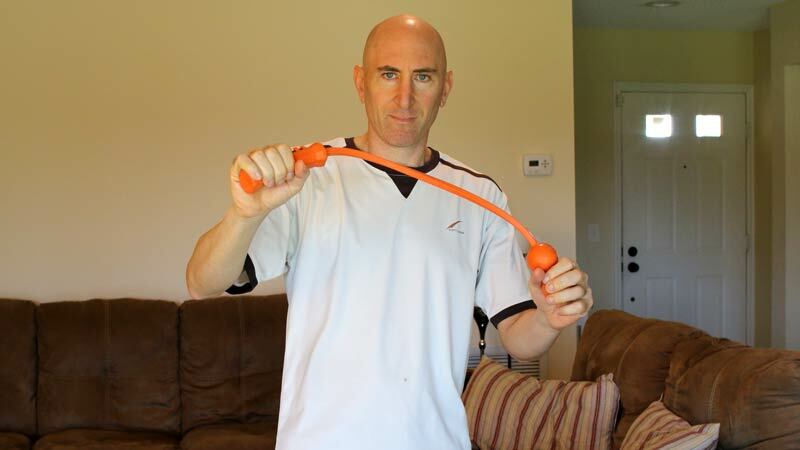 It includes a rubber handle attached to a rubber rope with options for one, two, or three rubber balls at the end. The grip was created for both righties and lefties and teaches the continental grip, which is used on all advanced tennis serves. There are three options to choose from when purchasing the ServeMaster. I’ll go over all three here. The device with one ball is excellent for young children up to ages 10-12. 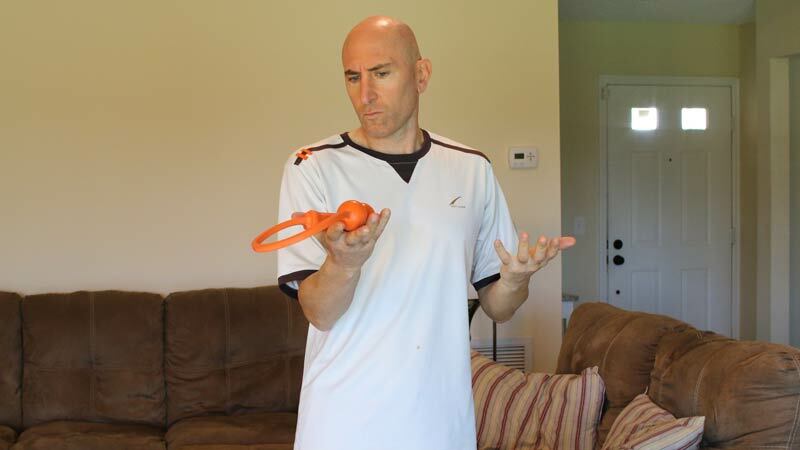 The device created with two balls will work for kids 12 and up. Adults can easily use this device as well. I personally use the two-ball ServeMaster to warm up before a match. 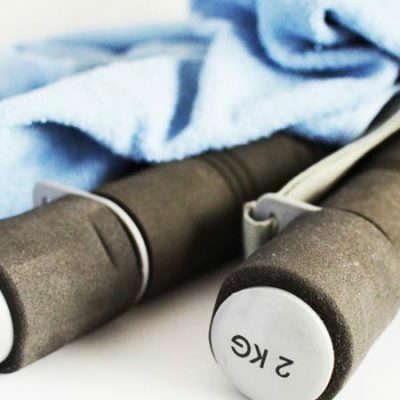 The third device is made with three balls and is ideal for stronger or bigger adults. The three-ball device, at about 16 oz (or one pound), is great for using as a warm up before serving. Use it for a minute and your racket (typically 10-13 oz) will feel super light when you serve. This is the heaviest of the three ServeMasters. 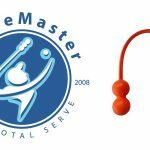 If you’re an adult new to tennis, I would recommend you purchase the two-ball ServeMaster, as it’s easier to work with than the three-ball model. Check the current price of the ServeMaster here. The ServeMaster is simple, durable, and fun to use. Many tennis coaches, as well as myself, use it with their students. When I teach the tennis serve to a child or beginner, it’s the first thing I use with my students. We’ll get into why next. Why Is The ServeMaster Effective? In my opinion, The ServeMaster is the most effective training tool for the serve on the market, period. First and foremost, it teaches the student to feel and use the continental grip, which is extremely important for advanced serves. It does this with check marks on the grip. The advanced tennis serve requires the continental grip. If not used, an advanced serve is just not possible. I also like that both righties and lefties can use the ServeMaster. I’ve personally seen both righties and lefties benefit from the tool equally well. 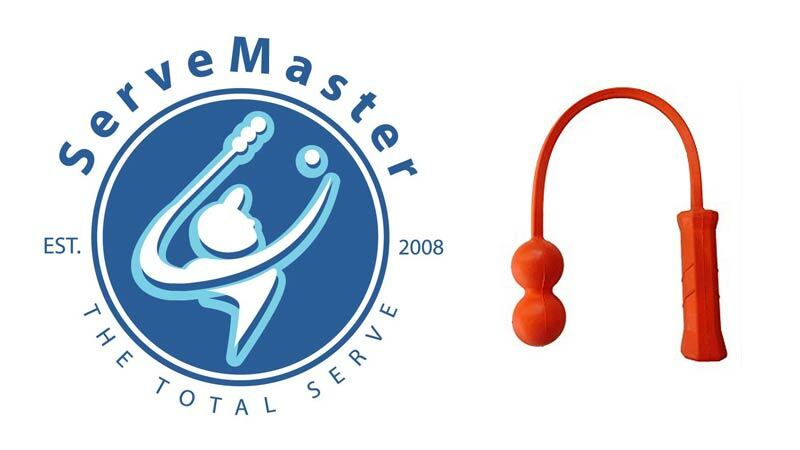 The ServeMaster is designed to simulate the feel of the racket with most of the weight being on the end. 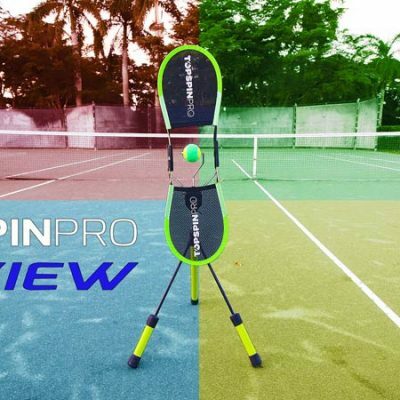 This gives the user the feeling or experience of how to move the arm and coordinate the body so that it’s in motion the entire time – just like a racket would be while in play. 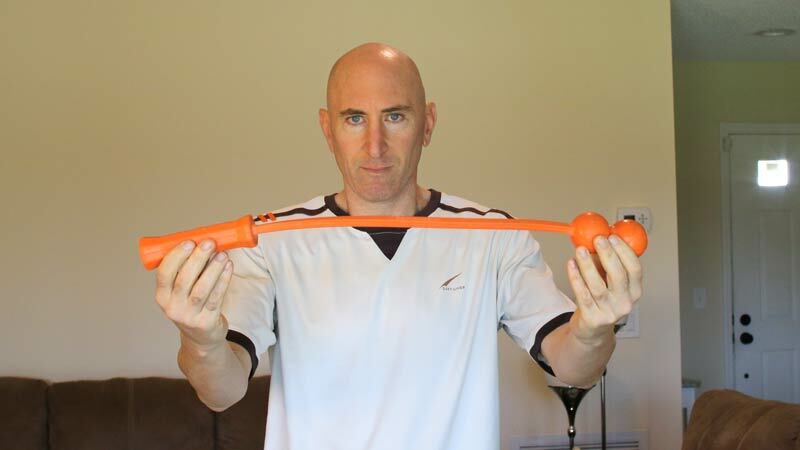 If the practitioner stops or slows their arm, the balls at the end of the device will hit their back. This lets the practitioner know that the swing is not the one fluid motion which it should be. This amazing device will simulate every part of the serve, including the all-important racket drop. The racket drop is an essential technique which so many adult club players struggle with in their serve. It is when the racket drops into what many players know as the “scratch your back” position. The ServeMaster can cure this flaw quickly and forever! Cleverly, the ServeMaster also teaches pronation! How the heck can it do this? I didn’t think that was possible to do with such a simple device. But yet it does. Pronation is one of the most confusing and misunderstood concepts in tennis. If you want to know exactly what it is, I wrote about pronation in a recent article. It can be difficult to apply the concept of pronation in your serve. The cool thing about the ServeMaster is that you don’t even need to know what pronation is, but by using the ServeMaster, it automatically forces you to pronate. For this reason alone, it’s worth the buy. The weight and length of the ServeMaster makes it a bit cumbersome to use at first. But once the practitioner learns the proper swing path, it’s very easy to use. We’ll go over how to use it a little later on. Once the proper swing path is learned, the practitioner can then incorporate the other components of the serve. These are the toss, the knee bend, the drive up, and the follow through. I know this next part may sound like hyperbole. But I’ve taught kids as young as eight to have a beautiful serve motion within half an hour. To swing the ServeMaster, proper serving mechanics are essential. Once the kids master the swing, all you need do is put a racket in their hand and they’ll mimic the perfect swing mechanics with the racket. While it’s true, that doesn’t guarantee kids or adults will have an awesome serve in one day. This is because of the other components of the serve. The player who wants to master their serve must work hard on the other basics, like the toss. And the timing of racket hitting the ball is very crucial as well. That’s where a lot of practice is necessary. But at least the most difficult part of teaching the serve is done, which is the basic motion. Before learning of the ServeMaster, I tried to manually teach kids and adults how to serve. I did this in a variety of ways. One of my favorite tricks was to have them toss a tennis ball in one hand and throw it with the other (simulating the toss and racket motion). However, none of my training tactics were nearly as effective as the ServeMaster. I can literally teach a kid how to use the ServeMaster in 5-10 minutes, then take it away and place a racket in their hand. I then ask the child to toss an imaginary ball and swing with the racket. Voila! The perfect serve motion in 10 minutes! It never ceases to amaze me when I see it. From there, we can work on the toss and their timing. To use the ServeMaster all you need is a tennis court. No ball, racket or special equipment is needed. If you don’t have access to a tennis court, you can use your backyard or an outdoor area that allows a radius of 25 feet from the user. Here is how Lisa Dodson, the creator of the ServeMaster, advises beginners to use it. Later in this post, I talk about the advanced version. Start by gripping the ServeMaster. The ServeMaster is labeled “R” on one side of the grip. This is for righties. The other side is labeled “L” for lefties. Each side has two “V” shapes on it that indicate where the hand is to be placed. See the picture on the side for a visual. Basically, the crease between your thumb and index finger will be on the V. The key here is to have the base or bottom of your hand hanging off the grip. Keep a light grip on the ServeMaster – avoid tensing up and gripping hard. Once you properly grip the ServeMaster, swing it gently at your side. You’ll feel how the weight of the balls shift your hand with the momentum they create. Do this for 30-60 seconds just to feel it. Next, set up in the proper serve stance with feet in a platform position. The lead foot should be at a 45-degree angle to the baseline and the back foot parallel to the baseline. For righties, the toe of the back foot should be slightly to the left of the lead (left) foot. Lefties can do the opposite. The hand that is holding the ServeMaster will be raised up so that the part of your arm containing your biceps and triceps is about parallel to the ground. Your arm will look like it’s in a throwing motion with your hand around the middle of your head and close to it. At this point the balls should be dangling behind your back. If you’re a right-handed player, put your left tossing arm straight up in the air. Keep it there for now. Lefties, do the opposite of all the instructions I give here. Gracias. Swing your right arm up by fully extending it upwards. At this point your left arm will begin to drop by your left side. Allow the swinging right arm to finish at the left side of your body. Don’t swing ultra-fast. A nice, controlled swing is what’s important here. If you do it right, you should be able to catch the balls with your left hand. That’s it! These six steps are how all beginners and children should start learning with the ServeMaster. This motion mimics the tossing arm staying high up in the air, which most club players and bad servers don’t do. It also trains the body to use the basic swing path of all advanced serves. It’s important the swing contains no hitches. If you stop the motion at any point, the balls will likely hit your body. You’ll then know you are not swinging correctly. Bam – instant feedback! Don’t worry it doesn’t hurt. A couple of key points that Lisa mentions in her videos is the use of the left hand and right leg in the serve (for righties). The left arm’s purpose is not only for tossing but for creating momentum for the body to raise up. It does this by coming down and to the left side. At the same time, the right leg is pushing off the ground, propelling the hitting arm and body upwards. Not to burden you with a thousand things, but there are more key points Lisa mentions. Here are two: keeping your head up and hitting out in front. You’ll want to keep your head, or chin, up during the swing up to contact. If the head drops, the body will likely drop too, not allowing for contact at maximum height. It’s always best to hit the serve at maximum contact point within your abilities; some people jump higher than others. Lisa also stresses hitting the serve out in front. During your swing, the highest point of the balls will be the contact point on the ball. In this exercise we’re not using a ball, so I just wanted to point that out. It’s vital to not just swing up, but out (meaning in the court) as well. The last thing I’ll mention in this part of the instructions is pronation. I told you earlier that the ServeMaster teaches proper pronation naturally. For righties, when you begin the swing make sure your palm is facing to the left. As you swing up, your palm will turn to face the court directly at impact (the zenith of the swing). Right after you reach the zenith, your palm will start moving to the right. After it does, just continue your motion in that position, with the right arm finishing its follow through to the left side of the body. Once you master the basic swing path just explained, you can begin to practice the complete serve motion. This will incorporate an actual toss, take back, and knee bend. Follow these instructions for the advanced use of the ServeMaster. Remember, they are written for the right-handed player. Lefties just use the opposite hand or arm. Start with “rope” part of the ServeMaster in your left hand while holding the ServeMaster about waist height in front of you with your dominant hand on the grip. Let go of the ServeMaster with your left hand and begin a tossing motion, with your left hand going straight up in the air. At the same time, move the right arm back and into the same “L-Shape” position you started from in the last series of steps (for beginners). Keep the right arm constantly moving after you begin the swing. Once the balls drop behind your back, you can then lower your left hand (the tossing hand). As the tossing hand lowers to your left side, the right hand will extend upwards and outwards, like you’re tossing a football. From this point on, the swing path is the same as the beginner method. The main difference is that you’ll have more momentum here and should leave the ground slightly and move into the court. Do this by jumping (a few inches off the ground is fine) onto your left foot. For those who can’t jump, you can just step forward with your right foot, using your left foot as a pivot. All the top professional players that serve with their right hand land on their left foot. So if you have no physical limitations, you should always land with your weight on the left foot. When you first start this more advanced method, it’s acceptable to not do part 6 of the above instructions. Just practice steps 1-5 without the jump to get the feel of the swing. Once you have it, you can then incorporate step 6. A few important key are to be noted here. One, bend your knees when you reach the L-Shape position with your arm. You should remain with bent knees (90 degrees is the ideal) while the dominant hand begins to drop out of the L-Shape. Once the arm begins the forward part of the swing, you should be uncoiling and slightly jumping forward and up. Your legs will obviously be extended at this point. It’s also important to make sure your left shoulder is higher than your right shoulder while the tossing hand is at its zenith. At impact (if you were hitting a real ball) the right shoulder will be high and the left lower. After you complete the swing, the left shoulder will then be higher once again. This is a cartwheel motion and creates a lot of power on the serve. One other important point is to keep looking up when you toss and don’t allow your body to sink down. Many club players drop their chins, not keeping their head up at impact, which causes them to hit lower than the maximum impact point. I know I said that earlier in the post, but I have to reiterate to make sure you do not lower your head. The beginning phase of the ServeMaster can be mastered relatively quickly. If you have coordination, 5-10 minutes should be good enough. The advanced method will take a little longer, maybe 10-15 minutes of practice a few times. Once you achieve the whole swing, there isn’t much room to deviate. No ball or racket is involved with the using the ServeMaster, so it really cuts down on the complexity. When you feel that you can complete the correct swing over-and-over and it doesn’t feel like a challenge anymore, you can begin to try with a racket and ball. You may want to try with the racket at first and no ball. Do this for a few minutes. Next, you can pick up a tennis ball and toss it during the motion. However, I have a little trick that will help you here. Instead of tossing to hit the ball, clearly toss the ball far to your right and out of your reach. Complete the rest of your swing as if the ball was perfectly tossed. The reason for this is to allow your body the feel of tossing while still completing the perfect swing. With your mind not focused on hitting the ball, you can focus on the swing. The final step is to actually toss into good position to hit the ball – just like a real serve. At first don’t worry where the ball goes. The most important thing here to continue the proper swing. Slowly you’ll make better contact and time your toss appropriately. The toss will really dictate how good your serve will be. You need to time your toss so that by the time your racket reaches the impact point, the ball will be at that spot. That’s really the tricky part of this whole deal. Keep practicing. 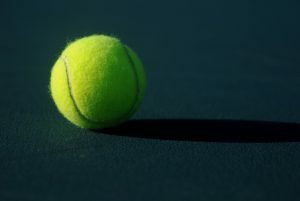 If you find that your swing is falling off tossing a real tennis ball, go back to the advanced method, practice that, and then come back to the real serve. Even if you start to hit great serves, I still recommend using the ServeMaster to practice your form. If you had a terrible serve to begin with, you will now see a marked difference in your serve. And all this can happen in just a few sessions of using the ServeMaster. You should now have a good racket drop, pronate and reach up to the hit the ball. Don’t underestimate using video. Video your swing when you go out and compare as you progress. Let me know how it goes. If you have any questions, drop them in comment box below. Thanks for reading!